Applegarth Villa & Restaurant sometimes limits bookings to 3 or more days. 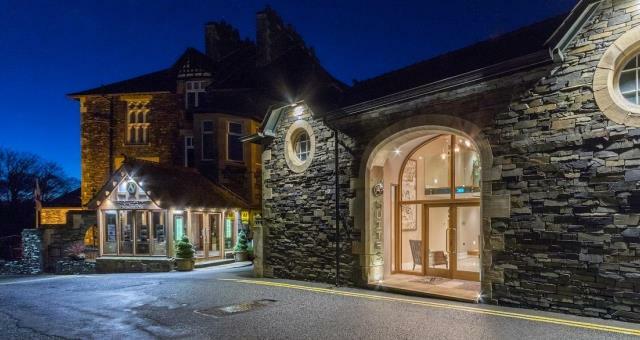 The magnificent room is the height of luxury boasting beautiful views over the Lakeland fells with a glimpse of Lake Windermere. Furnished to the highest standard by our interior designer the attention to details is outstanding. Tastefully co-ordinated with fabrics and soft furnishings the bedroom features a solid oak 4-poster bed with luxurious drapes, a large wall-mounted flat-screen TV, digital radio with i-pod docking, free wi-fi, direct dial telephone, refreshment tray, bottled Lakeland water, complimentary stationery, newspaper and Egyptian cotton bedding. The bathroom has 2 large feature windows. The Villeroy and Boch suite has a sumptuous bath complete with headrest, 19in flat-screen TV with floating remote and a special place for your champagne. With walk in luxury rain shower all tiled in exquisite Italian Travertine tiles we may not see you for dinner! Two nights require to be booked at the weekend.In certain circumstances it may be possible to accommodate a one night booking at the weekend. Please contact us before booking on-line to discuss your requirements. 09 Luxury sometimes limits bookings to 3 or more days. 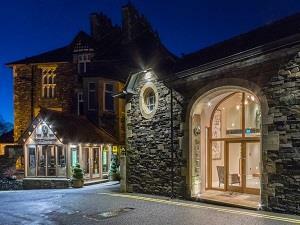 Applegarth Villa is a five star, adult only, small luxury hotel with serious style right in the heart of Windermere. Fifteen individually designed bedrooms and now seven luxury suites each with their own hot tub balcony and/or terrace also, many enjoying excellent views towards the lake and fells. Lounge bar, conservatory restaurant and private parking. From M6 jct 36, follow signs to Windermere. Approaching Windermere turn left into Elleray Road and first right into College Road. By rail, change trains at Oxenholme for Windermere. At Windermere station walk 200m down hill into Windermere and turn right into College Road.